This bridge, the Pont de Diane over the River Cher, is attached to the Château de Chenonceau in the Loire Valley in France . Diane de Poitiers, the mistress of Henry II of France , designed the bridge and had it constructed after she was given the château as a gift by Henry II. That's quite a generous gift :) Beautiful bridge, thanks for sharing it. Great post title, LOL. And lovely photo, too. 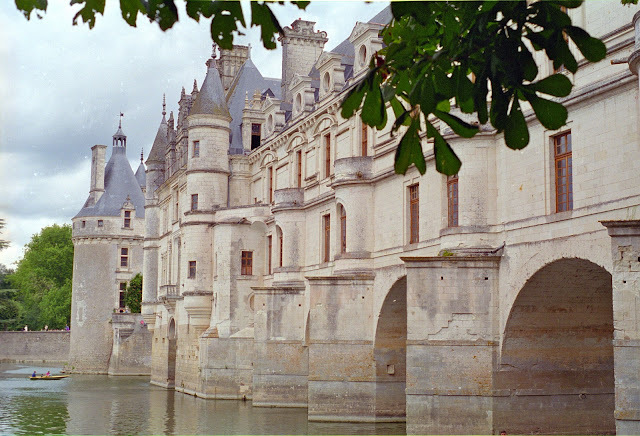 Loire Valley is an amazing area to visit as there are dozens of "chateaux" to see and visit. Chenonceau is a fantastic one, unfortunatly there are almost no furniture in it anymore (if I remember well...). If you're going in this area, also go to visit "smaller" chateau, where the owner drives you through his property (and you listen to the history of the family, see their ancesters, etc...). Great experience as well! I visited this castle while in high school. Our French teacher also pointed out the "rival" gardens... one was the mistresses, and the other was the wife's!